I recently posted about visible studio walls because of bad lighting (link) but most of those films had smaller budgets than SPARTACUS and yet the Universal flick is afflicted by the same problem. It's really inexcusable for such a film. It might not really be considered a goof but the lighting in this scene is terrible. In the previous shot we see Olivier walking around the bright sunny pool at the Hearst Castle and he ends up in this dark place. 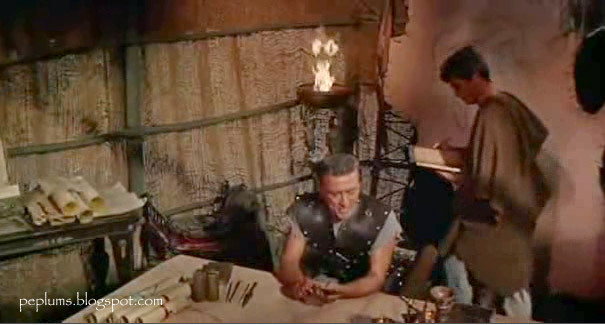 Every time I watch SPARTACUS I'm always aghast about how bad the lighting is here. There are shadows pointing in every direction. Stanley, Stanley, Stanley!!! I really never took notice to what you pointed out, but it was a fact that Universal had a way to cut costs without hurting any of it's movies. Maybe Stanley had a headache or a little too much the previous eve. This is not my top PEP too historically inaccurate, I agree with you. Which is your top PEP? It's hard to say what's the best PEPLUM: One can't compare a "serious" film like SPARTACUS with a pulpy, fun film like MACISTE VS THE MOLE MEN...so it depends...honestly, I prefer watching MOLE MEN than 3 hour SPARTACUS, which, like you wrote is historically inaccurate (in many ways). It's odd to say but the silent film CABIRIA is probably the best PEPLUM ever.